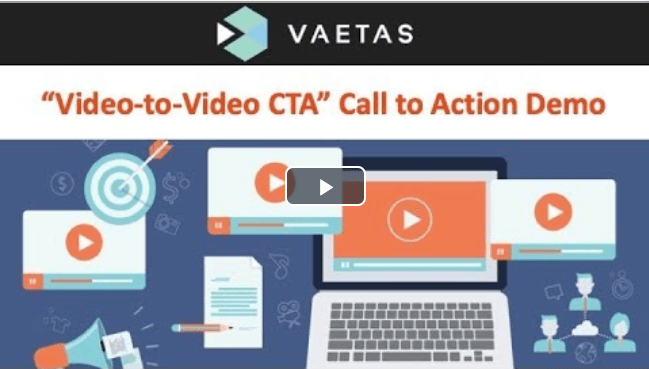 Vaetas call-to-action videos help you to better connect and build trust with prospects from your very first touch. Record and send personalized, trackable videos by email, text messages and direct social messaging. Vaetas Connect videos play full-screen for maximum viewer engagement. Allow viewers to email or call you directly from your Vaetas Connect videos, as well as schedule meetings or download PDF files. You can also automatically send them to any Web page. YOU control your viewer’s next action step – which increases conversions. Full Vaetas Connect Demo: 16 Minutes. Get a better return on investment than cold calling or standard email messages. Create relevant, interactive calls to action with a few button clicks. Viewers can easily contact you directly from your video. The Vaetas videos play full-screen for maximum engagement. No landing pages are required to embed your videos. Personalize your communication with prospects and customers so they can easily build a relationship with you! Vaetas offers a complimentary mobile app! Instead of the video just ending, or even having other videos show up, have your viewer(s) take the next action step with you directly from the video itself. The power of Vaetas lies in the ability for your viewer to take immediate action while engaged watching the video. Each call-to-action is designed for the different points in the relationship building process with your prospects and customers. Just one click and the call-to-action is automatically added to your video. You can even customize your call-to-action messaging to fit your needs. 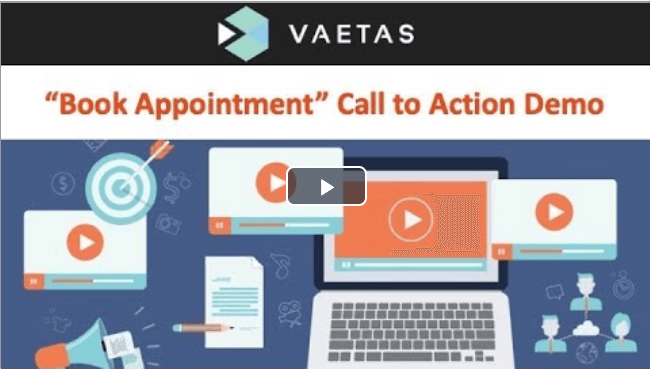 Each Vaetas Connect call-to-action is demonstrated in the short videos below. You can experience the power of Vaetas Connect's full-screen video display and call-to-action technology. Just click on each animated graphic in the drop downs for the calls-to-action that interest you. The videos will open in a new browser window, play full-screen and present the specific call-to-action. When a video ends, your viewer is automatically taken to any website of your choosing. A viewer can contact you directly from the video by email message. When a video ends, the viewer can download you PDF file, such as a sales brochure or agreement. Viewers can schedule a meeting with you directly from your videos. Your Vaetas calendar syncs with your Google Calendar and both you and your viewers receive email confirmations. When you send your viewers a video text message, they can call you directly from your Vaetas video. Capture your viewers email addresses right from your Vaetas Connect full-screen video. A video viewer can fill out a form of your own custom designed fields. Add your HTML code including "buy buttons." Your viewers can purchase products directly from your videos without requiring you to embed them on a web page. Automatically link your videos together with a simple click. The last video in the sequence has its own unique call-to-action. You can now introduce and pre-sell a longer marketing video, for example, using a short personalized video and the viewer will automatically be presented with your marketing video. The viewer can then contact you directly from your marketing video. Additionally, this CTA works with videos imported to Vaetas Connect from YouTube. Click the graphic to play the demo video in a new browser window. When you harness the power of Vaetas Connect, you'll take your business to the next level. By maximizing viewer engagement with full-screen video display and increasing conversions with Vaetas' patented call-to-action technology, you'll be able to quickly build trust with potential customers. Get people to open your emails, texts and direct social messages, view your videos, and take action - an action YOU choose! Quickly build your personal brand and communicate your expertise in your field of expertise. Maximize engagement and personalization – Present the “Authentic You” from your very first touch. Convert more Leads to Sales with patented call-to-action technology – YOU control their next steps! Be instantly notified when your video gets opened. Easy-to-use mobile responsive video email templates are provided. You have the choice of embedding your video’s poster image or an animated GIF directly into your email message which links to your full-screen interactive video. Send your call-to-action videos to prospects as a LinkedIn Message, and/or via Facebook Messenger, WhatsApp and others. Also post call-to-action video content updates to LinkedIn, Facebook, Twitter, Pinterest, Tumblr and Google+. We also provide you with a sharable URL of every video, for you to use as you see fit. We also provide you with the call-to-action embed code for every Vaetas video. Share your interactive videos via Text message, Skype, WhatsApp, and other applications. Designed to help you keep track in real time.